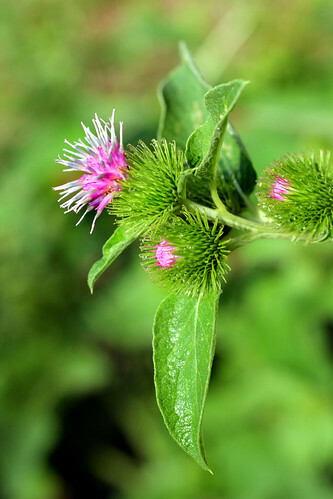 Burdock has been used for centuries to treat a host of ailments. It has been traditionally used as a "blood purifier" to clear the bloodstream of toxins, as a diuretic (helping rid the body of excess water by increasing urine output), and as a topical remedy for skin problems such as eczema, acne, and psoriasis. In Traditional Chinese Medicine, burdock is often used with other herbs for sore throat and colds. Extracts of burdock root are found in a variety of herbal preparations, as well as homeopathic remedies. In Japan and some parts of Europe, burdock is eaten as vegetable. Burdock contains inulin, a natural dietary fiber, and has also been used traditionally to improve digestion. In fact, recent studies confirm that burdock has prebiotic properties that could improve health. Despite the fact that burdock has been used for centuries to treat a variety of conditions, very few scientific studies have examined burdock’s effects.